Never let it be said that Croatia Online doesn't cover all ends of the spectrum when it comes to reporting on tourism news in Croatia. In a week when Czech tourists are extremely unhappy about Croatia's decision to ban the import of foodstuffs by travellers on a budget, Boat International has published a Superyacht Owners' Guide:the best of Croatia. Croatia Online's editor, Jane Cody, was fortunate enough to be asked to write the guide which is packaged with the July 2008 edition of the Boat International magazine. The guide, although requiring extensive research, was a joy to write. Particularly revealing was just how much Croatia's appeal to superyacht owners had changed in the three years since an earlier feature for Boat International. Yes, the rules and regulations for foreign flagged yachts are still less than ideal, albeit getting easier to work with, however Croatia's 5 star offering has improved dramatically and it's still difficult to beat the vast wealth of natural and cultural splendour which makes Croatia one of the best cruising grounds in the world. This book is the third in Boat International's series of Superyacht Owners Guides: the best of... and follows on from Valencia and the Carribean. Though it's obviously primarily aimed at megayacht visitors, it has plenty to offer to other tourists to Croatia, nautical or land based. 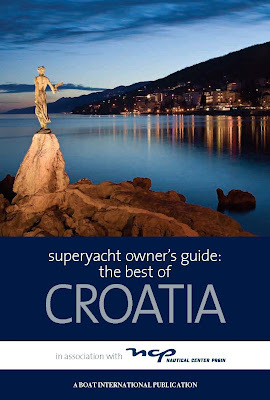 Contents include culture and background, food and drink, entertainment, UNESCO in Croatia, superyacht facilities, area highlights, special destinations, itineraries and captain's notes, all beautifully illustrated in a glossy A5 book produced with Boat International's normal regard for first class quality. Space and format constraints didn't allow us to mention the many people who helped us in the research for the book but a special thanks to Alen Maslov, a captain for Magnum Yacht Charter, who was generous with his time and expertise in assisting to pinpoint the best destinations for superyachts, and to John Nash, of Marina Facility Solutions, who was similarly generous in helping to identify, in detail, superyacht facilities available in Croatian marinas and elsewhere. The superyacht owners' guide was produced in association with Nautical Center Prgin (NCP) who are leading the field in superyacht facilities for Croatia and planning the first ever dedicated Superyacht Marina in the Mandalina area of Šibenik, in association with IGY. Many thanks also to Boat International for offering the opportunity to report on Croatia from a different, timely and fascinating angle, for being a pleasure to work with, and for producing such a quality end product. The July magazine, with the book supplement, is out now in the UK, and available imminently from good international bookstores in Croatia, such as the International Book Shop on Split's Riva. Otherwise you can get hold of a copy via the website. Finally, note that the Superyacht Owners' Guide is not intended to replace a conventional pilot or navigational guide, simply to highlight the best of what Croatia has to offer to superyacht owners. Dare we say it makes the perfect partner to our Croatia Cruising Companion? !